The collection of the Museum of Folk Arts and Crafts contains interesting forged metal animal sculptures. First of them appeared in exhibition rooms and ÚĽUV shops in 1957. Until then, this type of artefacts had not been present in the repertoire of traditional crafts in Slovakia. Hence, they captured the interest of ÚĽUV researcher Ján Okrucký. He dealt with the question to what extent were these artefacts based on traditional production and how it could fit into its overall framework. Similar types of forged metal animal sculptures were used as votive objects in the cult of Saint Leonard in some regions of central Europe. However, the production of forged metal sculptures in Slovakia is linked to domestic traditions. The overall appearance of the animals points to metal cooking pot stands used on open fireplaces. The first forged sculptures were made by Adam Vaverčák from Ždiar. He used exclusively iron. They are forged from one piece of iron but some parts, such as legs or horn, are welded to the body. The motives he used are the wild boar, horse, ox, cow and goat. Besides these, the collection of the Museum contains also newer forged animals made by Ján Kondač. 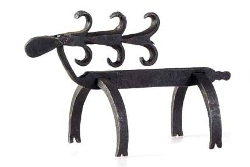 At present, ÚĽUV also promotes forged animal sculptures made by blacksmith artist Jozef Tomčala.